﻿ InvestmentCode - Comprehensive suite of Financial Calculators and Models. 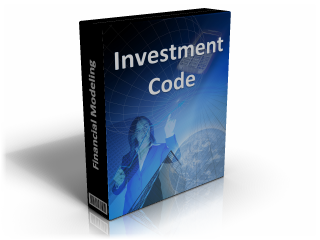 InvestmentCode is a comprehensive suite of investment calculators and modeling templates developed by ConnectCode. It significantly improves the productivity of investors and analysts on the different aspects of financial modeling. Equipped with over 100 financial templates in over 30 categories of finance, it certainly helps to reduce the effort in managing investments, calculating cash flows, optimizing portfolio, valuing bonds and equities, analyzing financial statements and performing forecast quickly and easily. Limited Time Special Offer !!! Click on the purchase page for the special discount! The models and templates are developed by an industry proven team that focuses on accuracy and quality. The templates are tested vigorously and have received positive feedbacks from the industry. All financial models are ready to be used out of the box. Want to optimize a portfolio? With a single click, regression of historical stock prices and plotting of the optimal portfolio curve are carried out automatically. 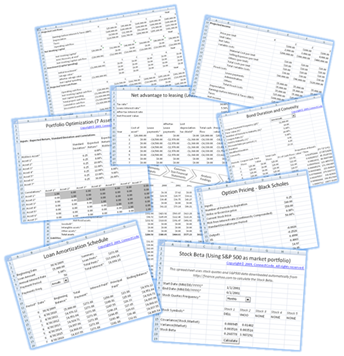 Want to calculate the Stock Beta? Simply key in the Stock Quotes and it is done! Capital Budgeting? Key in the estimates of the cash flow, the models will help you make comparisons of the cash flow before and after a project investment, forecast for the worst and best case scenario. Need to come up with a Pro Forma Financial Statement for Corporate Financial Planning and Forecasting? Key in the estimates of the cash flow, the models will analyze historical data, derive the Common Size statement, calculate forecast figures and perform financial ratio analysis. When is the last time that you have lost sleep to figure out what some of the existing models are doing. This will not happen with InvestmentCode. We provide comprehensive documentation on the different parts of the model. Even our Visual Basic Applications modules are comprehensively documented. Our models are designed with optimal customization in mind. The model formulas can be easily copied and pasted to other parts of the spreadsheet. The VBA modules are developed in an easy to understand and straight forward manner. This allows you to make changes to the model quickly and easily. All the templates are developed with emphasis on reusability. With reusability, productivity can be improved by combining several templates together in an integrated manner to form the basis of a new financial model. As the individual templates have been tested vigorously, reusing them also leads to less errors and mistakes in the models. All source code and formulas will be provided. We do not hide anything from you. This is important for any institution audits and verification. ConnectCode provides excellent priority email support to our registered customers. Customers are also entitled to a one year free upgrade of the software.